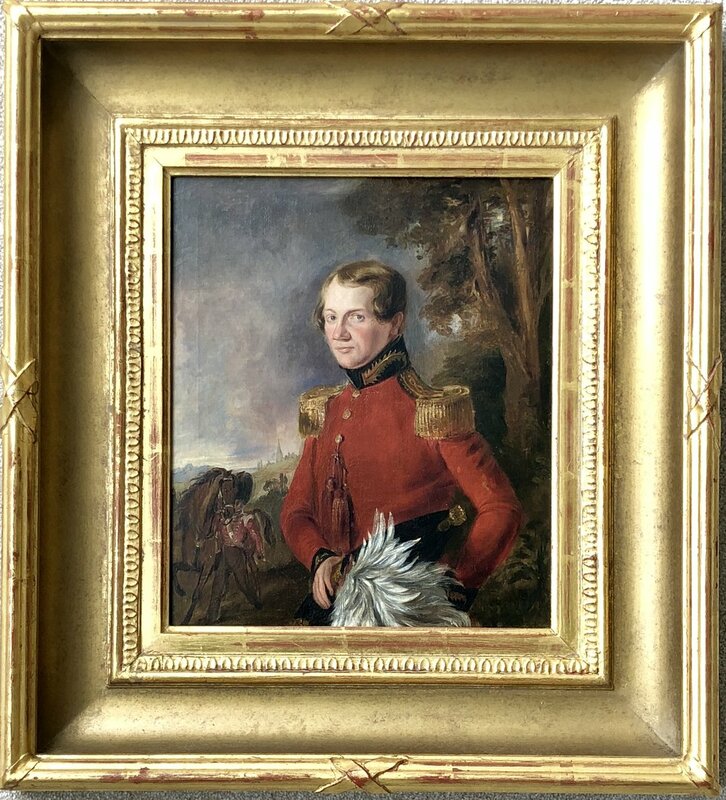 Striking, fine quality and highly detailed 19th century portrait of an infantry officer within a landscape. The handsome sitter is the very definition of dapper, he is painted half length, eyes to centre standing upon a bank. He wears a British military jacket with a decorated high black wool collar, a single row of brass buttons, elaborate fringed epaulettes and he carries a plumed hat. To his left another officer can be seen leading a horse, through a landscape, a church spire is visible in the distance. 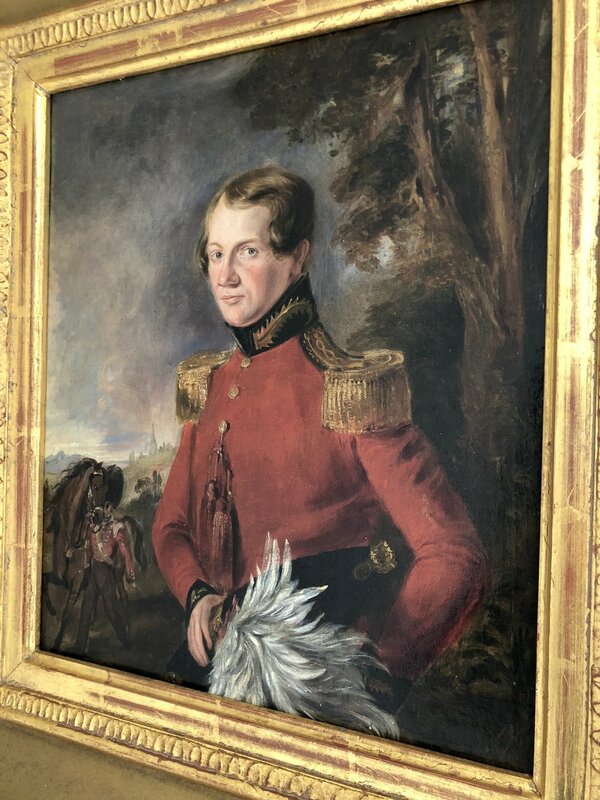 EARLY 19TH CENTURY BRITISH PORTRAIT OF AN OFFICER IN A RED TUNIC. The handsome sitter is the very definition of dapper, he is painted half length, eyes to centre standing upon a bank. He wears a British military jacket with a decorated high black wool collar, a single row of brass buttons, elaborate fringed epaulettes and he carries a plumed hat. Research has revolved that he is an Adjutant General or Quartermaster General in either the British army or the Hon. East India Company's forces. To his left another officer can be seen leading a horse, through a landscape, a church spire is visible in the distance. This genre of portrait was popular during the 19th century and there were many artists working in this area for both private commissions and public display. However this touching portrait of a charismatic gentleman, has all the hallmarks of a brilliant artist who knew how to get to the heart and soul of his subjects. It is beautifully presented in a fine gilt frame and is ready to hang and enjoy. Canvas: 14-1/4" x 12-1/4" / 36cm x 31cm. Frame: 22-3/4" x 20-1/2" / 58cm x 52cm.